There are many features that define even the simplest video cameras but the single most important aspect that affects picture quality is resolution. Summarizing the remainder of this page... Video image quality is a function of the number of horizontal pixels multiplied by the number of vertical pixels that make up a given image. The best analog images are 720 pixels wide x 480 pixels tall. This translates to 350,000 pixels per image or about 1/3 Mega-Pixel. HD-SDI camera images are either 1280 x 720 (720p) or 1920 x 1080 (1080p) pixels which translates to about 1 and 2.1Mp respectfully. Finally, IP cameras are capable of delivering even greater resolutions - 1.3, 2.0, 3.0, 5 and 10Mp are all (for example) common IP camera resolutions. Now, for those who may appreciate a more complete development of a technical concept... video cameras, regardless if we’re referring to those used in security systems or the really expensive variety that provide our favorite sport’s instant replays, all provide an image that is made up of small digital components called pixels. 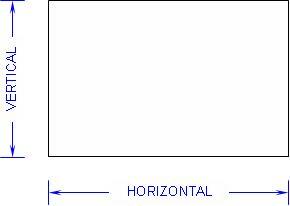 The format of every video image is defined by the number of Horizontal pixels and the number of Vertical pixels. Perhaps the simple diagram below will provide an better understanding? If we do the math (multiply the horizontal resolution by the vertical resolution) we come up with total pixels per picture these analog technologies deliver. Note this big number has led to the creation of another “industry speak” definition – MegaPixel – which stands for million pixels. The typical HD camera with 2,073,600 is often referred to as having 2.1 MegaPixel (MP) resolution. 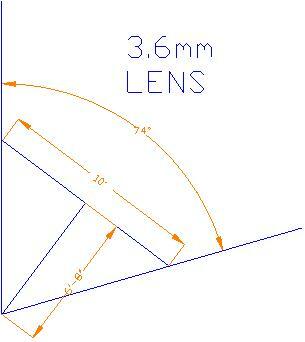 The drawing (below) – a typical 3.6mm (focal length) camera example – is one we’ll use to detail how image resolution influences video quality. 385 (horizontal) pixels (~5x CIF) when recorded at HD. When considering the post recorded zoom capability of the HD image, one can “zoom in on” the image about 2x and 5.5x while maintaining the same clarity (or pixilation – distance between adjacent pixels) as the D1 and CIF recorded images respectfully. This difference (HD vs. D1 or CIF) is HUGE (and even greater when considering the higher resolution range of MP-IP cameras) as this level of image resolution is often the difference between identifying a subject or capturing a license plate who’s face/numbers are legible vs. one that is merely a blur. To see some real world pictorial examples of HD camera image quality please click here.